How custom ActionSprout tags like donor, volunteer, and even troll, can help better track Facebook followers. Our custom tag feature lets you assign supporters a descriptor that will then stick with them throughout the app and data exports. 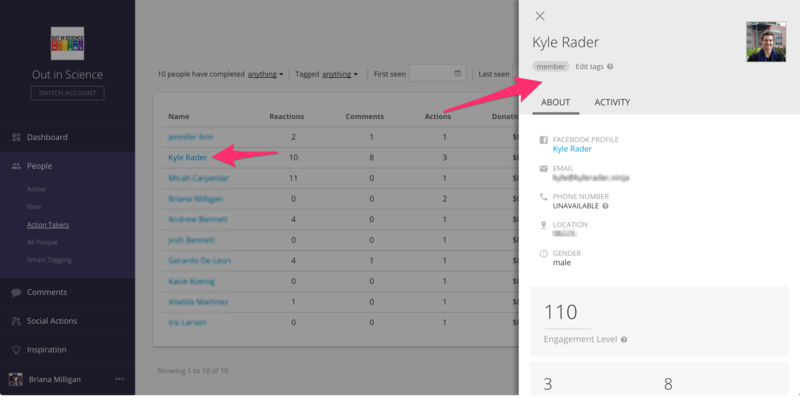 This will help you and your team better keep track of how different people have engaged with you, for more efficient and effective targeting. You can apply tags in what we call the "People Drawer." To open the People Drawer, click on any supporter's name anywhere they appear in the app. A menu will pop up, and at the top, you’ll see Add/Remove Tags. What kind of tag can you add? Anything you’d like, as long as it's 255 characters or less! Each person can have unlimited tags. So really, the sky's the limit. Once you've assigned tags, you can then filter your supporters by those tags. Open People and then All People. See the Tagged With option at the top? Click on it. This will open a dropdown of all your current tags. Select the tag of your choosing to see everyone you've given that tag.